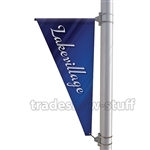 The Custom Street Pole Banners come with the necessary mounting brackets for mounting to most sizes of street poles. 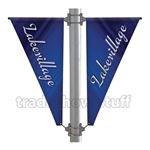 You can choose the single-span for one boulevard banner or the double-span for two boulevard banners. 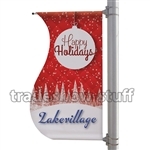 High quality banners are double sided and utilize strong top and bottom pole pockets to withstand the elements. 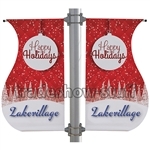 The rust-free cast aluminum brackets have fiberglass arms to keep the banner from sliding off. Kits include 40" stainless steel bands to hold each bracket in place.